Following months of planning, Warner Bros. has at last assembled its team to be chained together and sent into the fray, where they’ll face the no-win proposition of playing beloved comic-book characters. The official cast for David Ayer’s Suicide Squad has been revealed, and it contains numerous names you’ve heard before—though not all of them playing the characters you may have expected: Margot Robbie as Harley Quinn. Will Smith as Deadshot. Tom Hardy as Rick Flagg. Jai Courtney as Boomerang. Cara Delevingne as Enchantress. 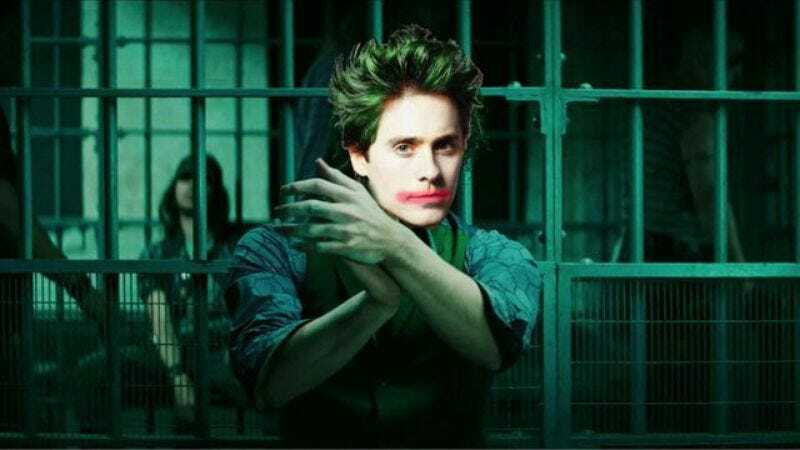 Jared Leto as the Joker. And, of course, the ghost of Heath Ledger, as the Squad’s Major Onus. With all of the above officially on board as characters who turned to the villainy expected of the very attractive, only to be coerced into using their talents for the kind of government work meant for ordinary-looking people, Suicide Squad is now set for its release date of August 5, 2016. And presumably, most—if not all—of these people are already in discussions for appearances in the many, many DC films to follow that are currently in need of supervillains besides Jesse Eisenberg’s Lex Luthor (who could still cameo here), else they would just be very boring movies in which people mope about their powers. Instead, they can do that while bantering with Will Smith.